Jakarta Provincial Government is successfully reduce poverty rate and gini ratio in Jakarta. Especially, current poverty rate touches the lowest rate in last four years.
" It surely becomes our strength to do more"
It is proven that City efforts in maintaining price stability and food distribution plot, providing employment, affordable food bazaar, distributing Worker Card for laborers, creating OK OCE entrepreneurship program, funding education aid through KJP Plus, and providing affordable transportation service through OK OTrip are quite effective in lowering poverty rate and gini ratio in Jakarta. 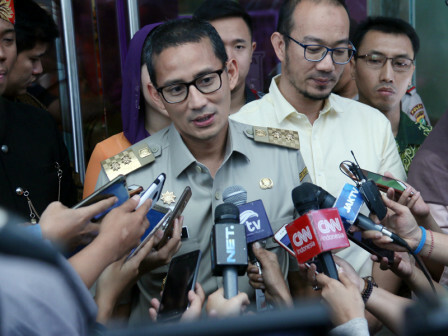 Due to this achievement, Jakarta Vice Governor, Sandiaga Uno appreciates all apparatuses in Jakarta Provincial Government for their hard work in lowering poverty level and inequality in Jakarta. "It surely becomes our strength to do more. Influential factors in suppressed poverty rate are inflation maintenance and increase in employment," he conveyed, Tuesday (7/17). In order to suppress poverty rate increase in the future, he affirmed that Jakarta Government will continue to intensify its programs to control the price. Moreover in realizing affordable food commodity price, especially commodity that could trigger poverty level. "We will optimize Jakarta Inflation Control Team (TPID) and BUMD in food sector that I usually called as food cluster," he said. Compared to September 2017, based on World Bank criteria, expenditure distribution on the lowest 40 percent group in March 2018 is 17.16 percent. "It is the proof that population inequality rate in Jakarta is including low," he added. Based on information from Jakarta BPS issued per March 2018, percentage of poor people in Jakarta within one semester (September 2017-March 2018) reached 373,120 people or 3.57 percent. This amount is reduced by 20,010 people compared with total poor people in September 2017 where it reached 393,130 people or 3.78 percent. Based on poverty line information, we can also know the average expenditure per capita per month is 2.57 percent in September 2017-March 2018 period, or from Rp 578,247 per capita per month into Rp 593,108 per capita per month. Meanwhile, Jakarta gini ratio is decreased by 0.015 point, which is from 0.409 in September 2017 into 0.394 in March 2018. Jakarta BPS also mentioned that food commodity plays a significant role towards poverty line rather than non-food commodities such as housing, clothes, education, and health. Food commodity support towards poverty line in March 2018 is 66.46 percent. While in September 2017 is 66.27 percent. The most important commodity for poor people is rice. In March 2018, rice expenditure donation contributes 23.72 percent towards Food Poverty Line. Besides rice, other staple foods that have considerable effects on food poverty line are filter cigarettes with 15.89 percent, chicken meat with 7.63 percent, and chicken egg with 6.49 percent.